THANKAVADIVEL, Ramanan and KLEINVELDT, Lynn (2017) Academic Libraries’ position in developing Mixed Societies: the case of South Africa and Sri Lanka. Paper presented at: IFLA WLIC 2017 – Wrocław, Poland – Libraries. Solidarity. Society. in Session 112 - Poster Sessions. Technological revolution and globalization is the key driver of 21st century models of information dissemination. Institutional repositories provide communities outside the borders of higher education institutions the opportunity to access different scholarly work. 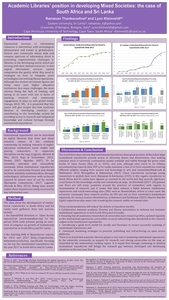 Taking into consideration the Horizon2020 work programme 2016-2017: “Science with and for society”, the poster aims to showcase the current state and development of institutional repositories in South Africa and Sri Lanka. The data about the development of institutional repositories in South Africa and Sri Lanka were gathered from the OpenDOAR directory of Open Access repositories and the Ranking Web of Repositories, focusing on the top five institutional repositories for the year 2017 in South Africa and Sri Lanka. The January 2017 webometrics results (Ranking Web of Repositories, 2017) depicted South Africa being the leader in disseminating research output on the African continent. Although a huge achievement for increasing the visibility of research in South Africa, it required collaboration between the academic library and faculty. University libraries in Sri Lanka have initiated digital repositories to preserve and disseminate research while embracing cutting-edge technologies to cater to their users. At present, Sri Lankan university and public libraries are gradually being automated to satisfy the user communities whose expectations are run with international counterparts. It is recommended that all academics and researchers have their research profiles updated regularly on the institutional repository, to increase visibility which will assist in university ranking in developing countries. 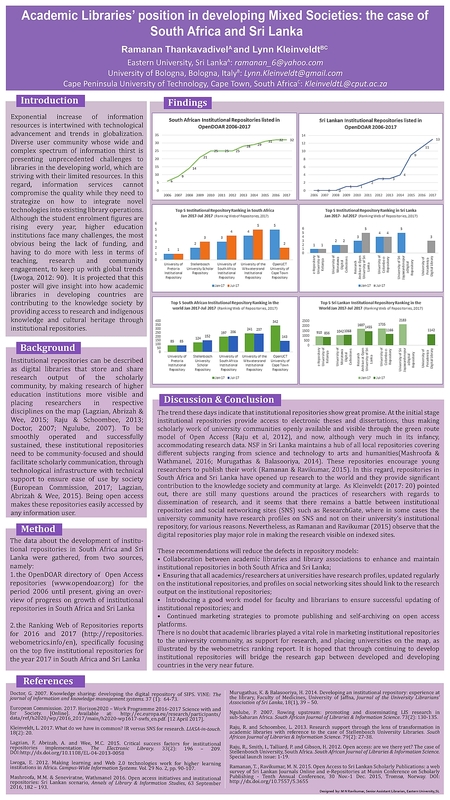 This poster will give insight into how academic libraries in developing countries are contributing to the mixed societies by providing access to research, indigenous knowledge and cultural heritage through institutional repositories.